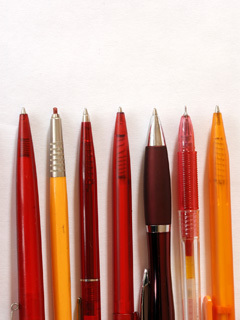 According to the most recent statistics from the Writing Instrument Manufacturers Association, nearly 5 billion pens were sold in the U.S. in 2008. The vast majority of pens are predominantly made of recyclable plastic—high-density polyethylene (No. 2), low-density polyethylene (No. 4) or polystyrene (No. 6). As with all plastics, these are petroleum-based products, and disposing of them in a landfill, instead of recycling them as feedstock for more pens, means more petroleum is needed to produce new pens. Additionally, some inks found in older pens can contain harmful chemicals such as acetone, ammonia, cresol, ethanol, naptha, phenol, toluene or xylene, which can leach into groundwater from landfill disposal. There are very few organizations recycling pens. Terracycle, a Trenton-based company that collects many types of post-consumer waste to convert into new consumer products, accepts all manner of writing instruments through their Writing Instrument Brigades. These brigades are mostly based out of schools and universities (which receive 2 cents for each instrument collected), but currently there is no searchable directory of participating organizations. However, Terracycle plans to offer a searchable database which organizations can opt into within the next few months, so check terracycle.net frequently for the new listing. If you’re willing to organize your own brigade, Terracycle will pay shipping costs for sending the pens to them, and you’ll be able to donate the 2 cents per pen to the school or charity of your choice. If you’re looking for a more immediate solution, The Pen Guy (penguy.org), a plucky graphic designer in California, is on a mission to collect 1 million pens for use in a variety of art projects, such as covering his 1981 Mercedes Benz in used pens. You can mail your dead pens to: The Pen Guy, P.O. Box 994, Forestville, CA, 95436, but you’ll have to pay the postage yourself. Have a recycling challenge of your own? Email recycle@gridphilly.com.